Thrasher Trailways have been serving Alabama’s motorcoach needs for over 45 years! Family owned and operated, we are continuing our tradition of proven reliability for Charter Buses in Birmingham. Our new Rental Buses bring our service to a new level. 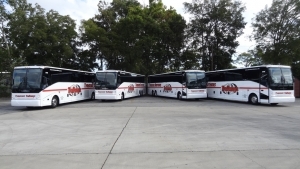 If you have not ridden in one of our modern motorcoaches, you are still just riding a bus! Thrasher Brothers is the only company in the Birmingham market with Nationwide Trailways Service. All coaches are equipped with WiFi, and the Voyager GPS systems for tracking our coaches all over the U.S. and Canada. At the Trailways National Meetings Thrasher has been awarded its ‘Vision Award’ in 2012, and ‘Outstanding Community Achievement’ recognition in 2015. Contact Thrasher Trailways to Rent Charter Buses to Huntsville, Montgomery, Tuscaloosa, Mobile and all of Alabama. You can also Rent Charter Buses to Nashville, Memphis, Knoxville and all of Tennessee. You can Rent Charter Buses to travel to Atlanta, New Orleans, Dallas, Orlando and all over the United States! Call us today for a quote, or fill out our quote form! The Wesleyan Youth Choir has traveled with Thrasher Brothers since 2004. The drivers are safe, courteous and extremely competent. They make a real effort to connect with our kids and quickly become part of the team. Thrasher Brothers does more than provide transportation; they provide an individual who will make your trip better, make your life easier, and become your lifelong friend. WE LOVE THRASHER BROTHERS!